This book is a definition and defense of the Family Integrated Church Movement (FICM) and specifically an impassioned cry to eliminate all programs from the church which divide families for teaching times, including nursery, Junior Church, Sunday School, and especially youth classes. 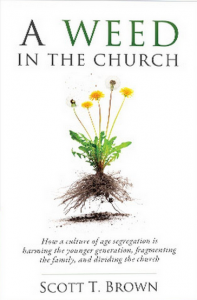 Brown says, “The proposition of this book is that the philosophy and practice of systematic, age-segregated youth ministry as defined in this book is indisputably unbiblical in its pattern, inherently destructive in its impact, and undeniably unchristian in its origin” (280). Brown’s (and similar writers such as Voddie Baucham Jr. and Eric Wallace) proposition is that the church fell into a worldly mode 200 years ago with Robert Raikes and the Sunday School movement. He believes the pattern of separating families for various services of the church can be traced through modern education and psychology to the eventual emergence of the youth pastor and youth ministries of today, a phenomenon which Brown thinks is totally unbiblical. Of course, Brown and others find it easy to reference all the obvious negatives that have happened in the history of Sunday Schools and youth groups to which the reader quickly agrees. Brown basically searches through Old Testament scriptures, finds examples of families together, and then proposes that this is the only pattern that God has approved for the New Testament church. For a New Testament pattern, Ephesians 6:1-4 is the primary text he uses for fathers teaching the children (but in church?). Since Brown never sees families in any other mode than together in the entire Bible, he concludes that God has not given permission to ever divide the family for any reason. Brown relies heavily on the Reformed “Regulative Principle” which says that we may only use in church what is specifically seen or commanded in Scripture. But there is no command given specifically to the NT church to always integrate family members in the services of the church. Brown simply finds examples of family integration in the OT and then brings them forward into the NT and says we find “no other” command in Scripture. Since most Reformed writers see the church in the Old as well as the New Testament, it is easy for them to see this as an absolute pattern for the church. When situations such as Jesus (or Paul) separating disciples for ministry are mentioned, these are written off as special cases for training leaders and are therefore exceptions. But it would seem that Jesus (though in a pre-church time) is a closer pattern for the NT church than theocratic Israel. The church IS a family for any individual who believes and may even, at times, supersede the natural family (Mt. 10:37).